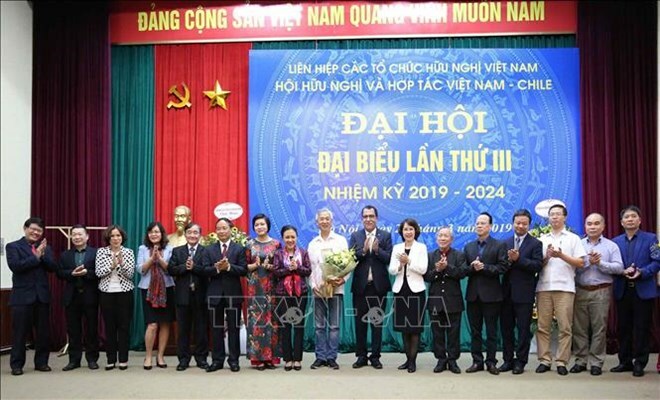 Hanoi (VNA) - The Vietnam-Chile Friendship and Cooperation Association (VCFCA) under the Vietnam Union of Friendship Organisations (VUFO) held its third national congress for the 2019-2024 tenure in Hanoi on March 27, seeking to promote friendship and cooperation between the two countries. Speaking at the event, Vice Chairman of the VCFCA highlighted the active development of the bilateral relations in the 2013-2018, and reviewed activities of the association in the period, especially its efforts to enhance people-to-people exchange between Vietnam and Chile. Participants agreed that the association should focus on reinforcing its organizational structure towards making its activities more effective, while developing its membership, especially young members and entrepreneurs that have business relations with Chilean partners. Attention should be paid to activities that can promote economic-trade, culture-art, education-training, and tourism cooperation, and people-to-people exchange, they said. Discussion sessions, talks and screening of Chilean films will be arranged, towards fostering mutual understanding between the two sides’ people. In her speech, Chairwoman of VUFO Nguyen Phuong Nga praised the association for its achievements in the 2013-2018 tenure and its contributions to promoting people diplomacy and trade cooperation between Vietnam and Chile, expressing her hope that the VCFCA will make more activities to contribute to strengthening the Vietnam-Chile friendship and cooperation. For his part, Chilean Ambassador to Vietnam Jaime Chomali thanked efforts by the VCFCA’s executive board and members in bolstering solidarity and cooperation between Vietnamese and Chilean peoples.